Let’s start with a perfume pick – Paco Rabanne Olympea is surely one of the prettiest fragrance bottles around and it looks so beautiful on my little perfume tray. The bottle was designed to be a sort of modern day goddess essential, and the ad campaign was really nice. The scent itself is a tiny bit sickly when you first spritz it, but it dries down to something warmer and muskier which is right up my street. Definitely a pick for a girly day! If I could give a prize purely based on packaging, I would give it to the Urban Decay Naked Ultimate Basics because it’s just so lovely! It takes pride of place on my dressing table, because it just looks so beautiful and needs to be displayed. Inside are some gorgeously pigmented matte shadows as well, but I definitely fell in love with this pick just because of how it looks. Of course I had to mention Charlotte Tilbury, and in particular the Filmstar Bronze and Glow. A product that makes me feel fancy and sophisticated every time I use it. With a bronzer that can add definition and warmth to the skin and a silky soft highlighter that adds a glorious amount of glow to the cheeks; it’s a makeup pick not to be missed. One of my favourite lip products is the Clarins Instant Light Perfector; a truly dreamy formula which adds the perfect amount of glossy sheen to the lips as well as adding moisture and a nice element of ‘my lips but better’. If that wasn’t enough, my smell delicious! Like caramel. Lastly, a new pick! The Too Faced Papa Don’t Peach blush was just too cute to resist. I love the name (anyone else really appreciate puns in makeup? 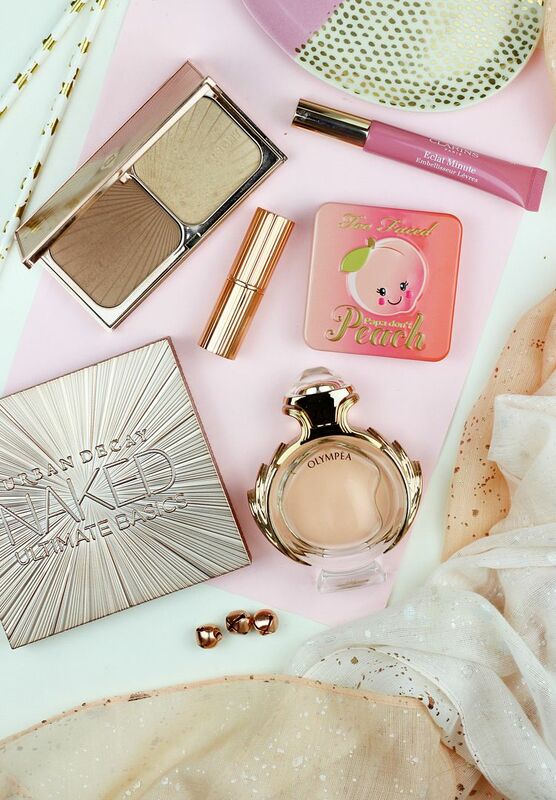 ), I love the cute little peachy face and I love the shade which adds a beautiful shimmery flush to the cheeks. I know the peach collection is really hyped, but this blusher really is dreamy.